Now the latest way to unlock frp from Asus latest Android 8.1 devices, After the update of a latest patch than on the talkback option “Help & Feedback” option is missing. 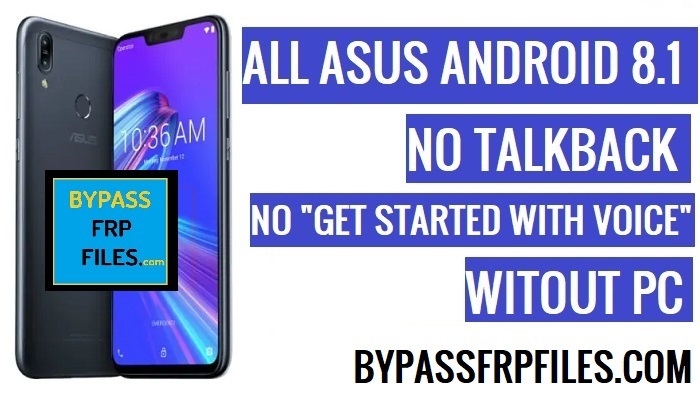 and this is the main problem because we can’t access “Chrome” browser that helps to Bypass FRP Asus Zenfone M2, so in 2019 we share with you the latest method to Asus X01AD FRP Unlock easily. This method we successfully worked on Asus M2 X01AD. -First of all, connect your device to a working internet connection. -Then go back to the very first home screen of your device. -Enable pin lock in any working sim card using any other phones. -Then it will ask you to input the password. -Now put the right password and then your device will go to the “Lock Screen”. -On the lock screen of your device, you will see a “Not sign in” notification. -Then tap on the “More Settings” option. -After that, a new window will open, click on the “Android Setup”. -Now click on the “Home App” and then select “Opening Links” there. -Then select “Chrome Browser” there. -Then tap on the “Chrome” once again (See Below image). -After that, Tap on the “App Notifications” and then select “Additional Settings”. -Now click on the “3dots” from the top right corner. -Now tap on the “Search” box and type there “Switch Access”. -Once the results have come, then tap on the “About Switch Access for Android”. -Now you will see a “Youtube” video, just tap on that, and play the video. Note:- On the Youtube applications if you see “Update” or “Not Now” option then tap on the “Not Now” button. -Then you will be redirected to youtube application. -Now follow the final process to Bypass FRP Asus Zenfone M2. -Then tap on the “Profile” icon or “3 dots” from the top right corner and then select “Terms & Policy” option. -Now you will redirect the “Chrome” browser, from the chrome browser welcome screen tap on the “Accept & Continue” then tap “Next”, then tap on the “No thanks” button. -But at first, we need to download only one application that helps you to Bypass FRP Asus Zenfone M2 without PC easily. -Once you downloaded the app, then you will get a popup button on the button bar of your device, simply tap on the “open” button from there. -Just click on the “Done” button to Bypass FRP Asus Zenfone M2 Without PC easily. -Then once again you will access the “Bypass FRP files” page, now download our second app. -Now download the “FRP Bypass (GD).apk” by following the same process that you did before. -Then install the downloaded apk by tap install-open. -Then sign in there with your any valid Gmail id. -Now you have successfully Bypass FRP Asus Zenfone M2 without PC easily. Thanks for visiting us, if you facing any problem with this Asus X01AD FRP Unlock, the method then you can comment us on below.